I have a personal story that I think illustrates this well. Like the rest of us, I have had many failed New Years resolutions over the years, especially the requisite “I will lose X amount of weight” one. But even “fun” resolutions were hard for me to keep up with. A couple years ago, I was interested in Argentine tango and had a resolution to go to at least one tango class a week. Of course, regular practice is the best way to learn something like that, but what happened was I got sick on and off for a couple weeks and missed classes, and then I had other pressing commitments that made me miss more. As months passed, I convinced myself that I had failed. Instead of feeling excited and curious about dancing, I started to feel embarrassed and ashamed and stopped going to any classes altogether. I started this path with a lot of wandering. I searched for classes even before the turn of the new year, trying out a couple different teachers in the area. I was still trying to figure out how it would work into my schedule so I didn’t commit to any regular attendance or class packages at first. Also I was still very uncertain and shy. Though my body issues are much better in regards to my appearance, I was self conscious about whether or not I physically do the dance, since I have struggled with a lot of low back/hip issues and poor flexibility for much of my life. It took a lot of energy to summon up the willpower to explore these classes, and I gave myself the time and space I needed to do so. During this wandering, I finally stumbled across Asia of Arabesque Belly Dance, just after the turn of the year. I went to one of her mixed-level classes and it just so happened that she was planning a new beginner-level class, starting later that week, that just so happened to fit easily into my schedule. I decided to take the hint. What started as sort of a whim has now become a dedicated passion. This week marks the exact two-year anniversary of the first class I went to. I am now going to at least two of Asia’s classes a week and sometimes venture out to check out classes from other local teachers or workshops. In the last two years I have even done a bunch of public performances with the rest of the troupe, from local street fairs to dance concerts in professional theaters. It is easily the most successful “New Year’s Resolution” I’ve ever had, and it’s even more notable in that it wasn’t really a resolution at all. It hasn’t always been easy, though. Although I have gained an impressive amount of strength and coordination through regular dancing, I still have to work very hard to overcome the limits of my body (severe pelvic muscle imbalances are the root of it all. Luckily, though, I recently discovered a new exercise/physical therapy regimen that has lead me to monumental improvements over the last few months. I will write more on that in another post soon.) I’ve slowly incorporated a more regimented approach to my practice (being diligent about going to classes, making them the priority in my scheduling, etc) but I’ve definitely kept up a sense of exploration and play as well, which has helped me maintain my enthusiasm. Another interesting thing I’ve noticed is that going in with a sense of curiosity and exploration–as opposed to a set idea of what I wanted to get out of the classes–has lead me to fascinating places. These days, when a lot of people think of bellydance, they think of the super juicy, sultry movements that are the primary practice of popular dancers like Rachel Brice and Jill Parker. 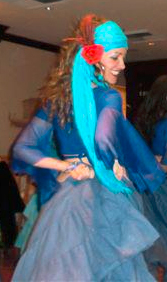 When I started with Asia, though, we spent a lot more time on other dance styles I wasn’t expecting at all: the controlled hip-y movements of classical Egyptian, the fast footwork and odd beats of traditional Turkish and North African styles, and the flamenco-style skirts and movements of zombra mora. All of these dances have cross-pollinated across the Mediterranean for hundreds of years so it makes sense for anyone looking to learn about the dance to learn a little about them all (and pull from them to develop one’s own style if they wish). I have been absolutely fascinated by this journey, since it has opened up my eyes to whole new areas of history and culture as well as dance. 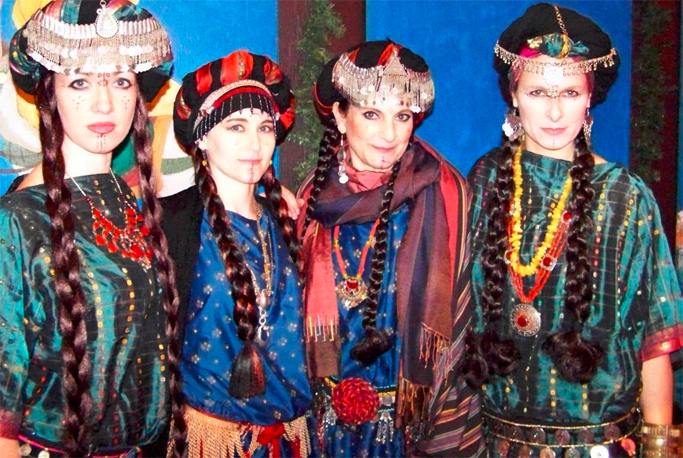 North African-inspired costumes for a routine we did at the Great Dickens Christmas Faire 2013. I am on the far left. I would chance to say, that if I hadn’t had a sense of exploration, if I had gone into these classes with a hard resolution of “I want to dance like Rachel Brice!” then I would have been way too frustrated. I probably would have quit long ago, thus depriving myself of such a wonderful journey. So in our new year, I of course encourage you to grow and change, but I invite you to do so by stepping into the unknown. Life is supposed to be a dance, after all, and while there are times for practiced choreography, most of our movements should be improvised play inspired by the music that is playing at the time.